Jadeite is a form of Jade which crystallises in the form of grains, masses, and rare small elongated prismatic crystals. The colour can range in many, including emerald green, white, red, orange, blue-green, and other shades of greens, black. As well as having the properties of Jade, Jadeite as it own qualities. Considered a stone of protection, this mineral was exalted by the Mayan and Aztec cultures as a stone of magic, bringing to fruition, in times of need, the protective forces of the ethers. It was also carved in the forms of deities, representing the aspects of protection and favourable fortunes. 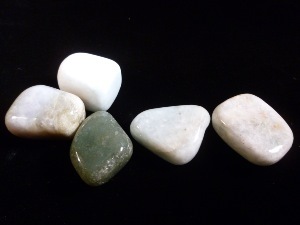 Jadeite may bring forth the abilities to unite and to improve dysfunctional relationships. The emerald green variety is recommended for these tasks. The name Actinolite is derived from the Greek word, meaning "beam” or "ray”, because of the mineral’s fibrous nature.